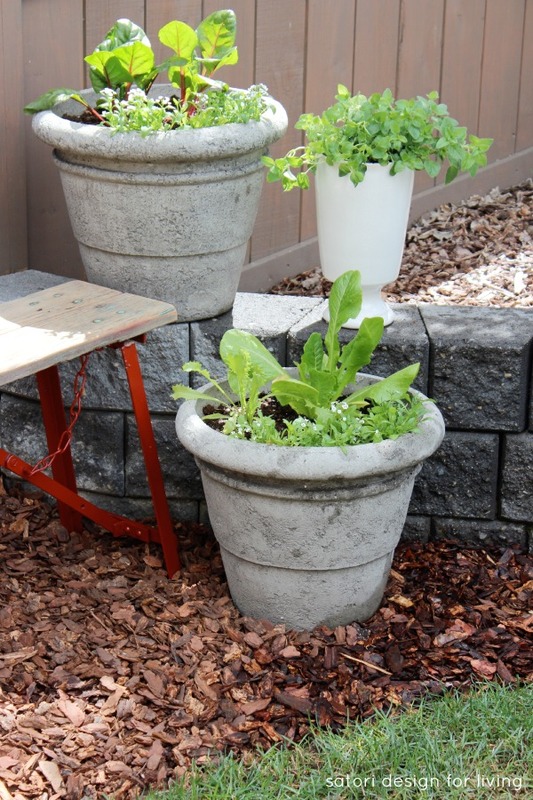 See how I created a container garden with vegetables and herbs using a weathered bench I salvaged from my parents’ farm. Love the pop of red! 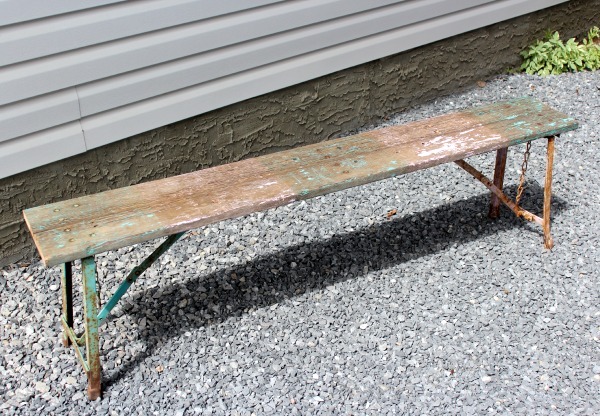 A couple summers ago, I discovered two weathered benches in an old shed at my parents’ farm that I decided to bring home with me. I managed to paint the larger one a bright yellow color for the Outdoor Extravaganza last year, and it eventually made its way to our front porch. The other smaller sized bench ended up being shoved under our deck and somewhat forgotten about. Last week, I finally pulled it out in an attempt to give it new life as part of our new herb and vegetable container garden. At first glance, I wasn’t sure I would be able to revive this worn out bench. It was a little worse for wear than I had remembered. I knew, without a doubt, that the pink chippy paint had to go. 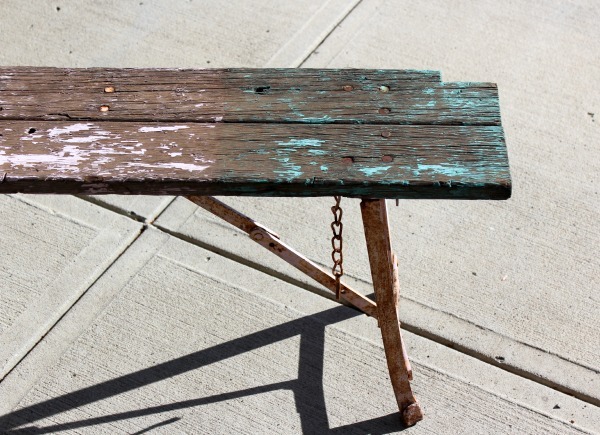 (It turns out the bench came painted those colors from a farm sale years ago.) One end was patched together in a hodge-podgey way, and I was hoping we could somehow fix or trim it without it being too noticeable. See what I mean? The only solution we could come up with was trimming both ends. This meant exposing the un-weathered wood, but I knew over time it would return to its rustic glory being exposed to the elements. 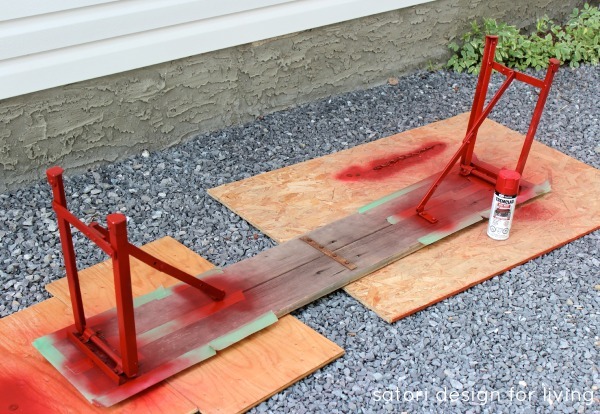 After a good sanding to remove the pink paint (I kept some of the blue-green) and large splinters, I spray painted the metal legs bright red for high contrast against the rustic wood top. 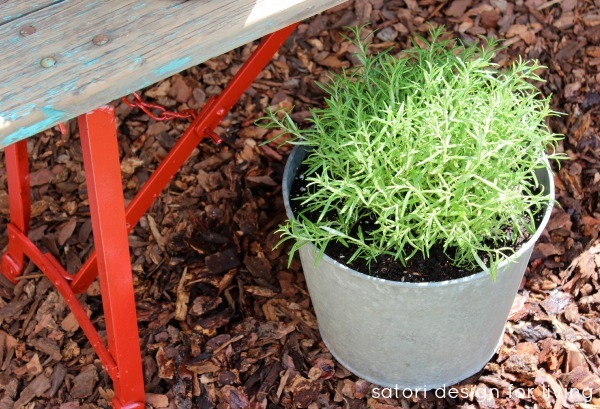 I thought the red would also tie in nicely to our new garden stool and pillows in our outdoor lounging area. While the bench was drying, we got to work digging out the sod in the back corner of our yard for the container garden. Being able to grow more herbs and vegetables is something I’ve been wanting to do for years. It was nice to finally be creating an area to do so. After removing the sod, we put down landscape paper to block weeds and topped it off with a layer of cedar mini bark. We put the bench in place with a slight slope to allow water to run off. Then, I started layering potted vegetable and herb plants on top and all around. Some of these came from the seeds I started back in March. 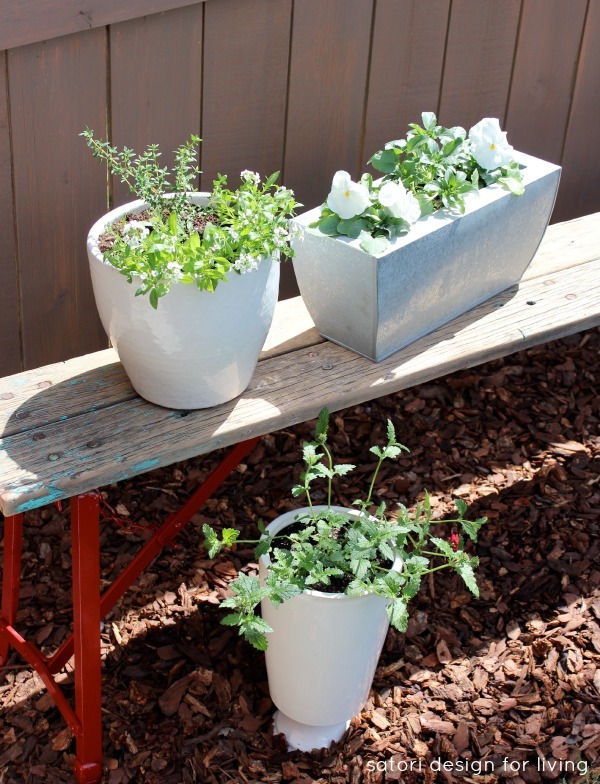 One advantage of container gardening is being able to move pots around to allow plants to get more or less sun/rain depending on what they need. Succulents can get burnt in direct hot sun. If necessary, I can easily switch their placement with rosemary or another plant. To attract bees and butterflies, I added some flowers as well. 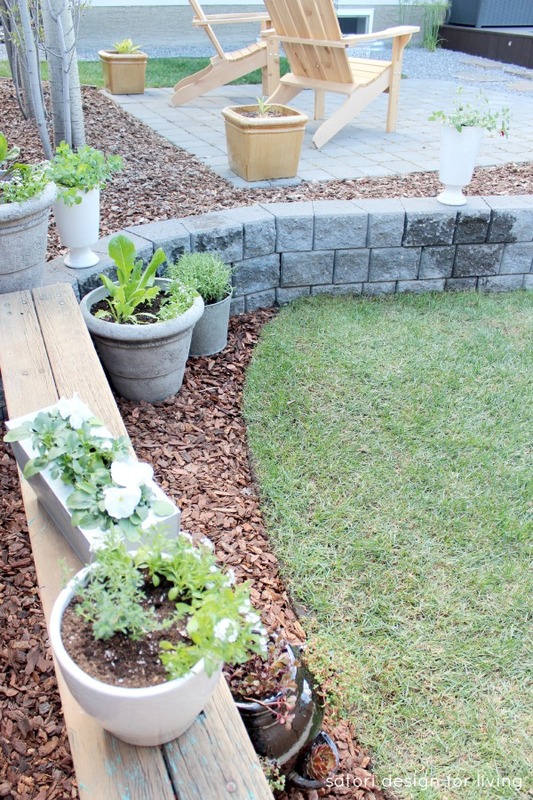 White pansies, alyssum and red verbena help tie our backyard color palette together. 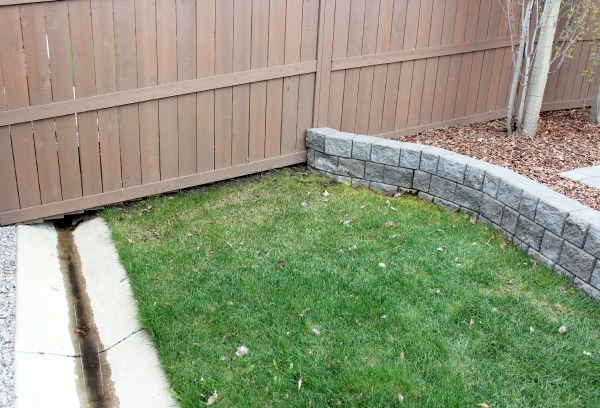 Aside from the bench, our stone retaining wall is the perfect place to house more pots. On the ledge, I planted swiss chard and oregano. Below, there’s lettuce and rosemary. It’s a good start to a container garden that will likely evolve over the summer and years to come. I can’t wait for the plants to grow and fill in the area. The best part will be eating the herbs all summer long! Not bad for a weathered bench, right? 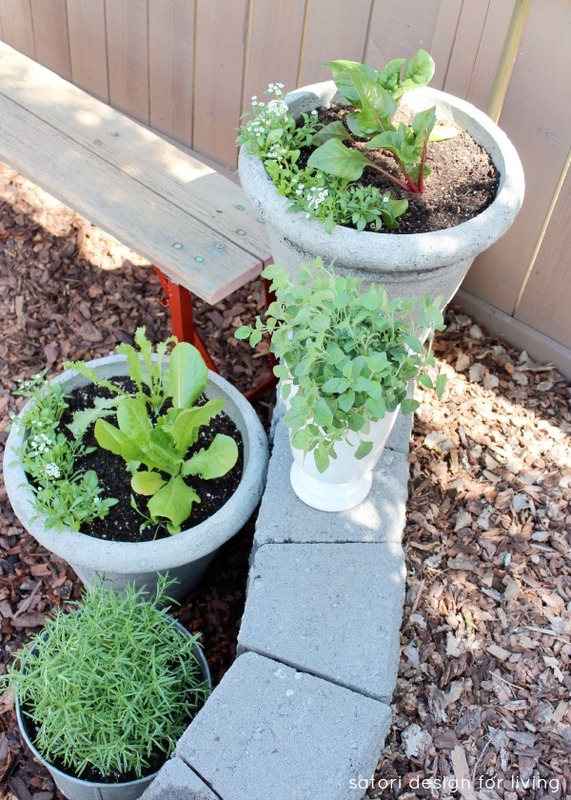 Do you like growing your own vegetables and herbs? 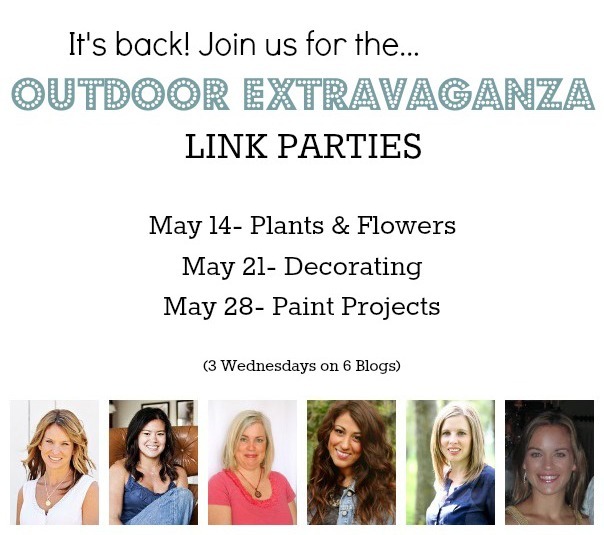 Be sure to come back tomorrow for the Outdoor Paint Projects link party where your project will be seen on 6 blogs! It’s the final week of this year’s Outdoor Extravaganza. 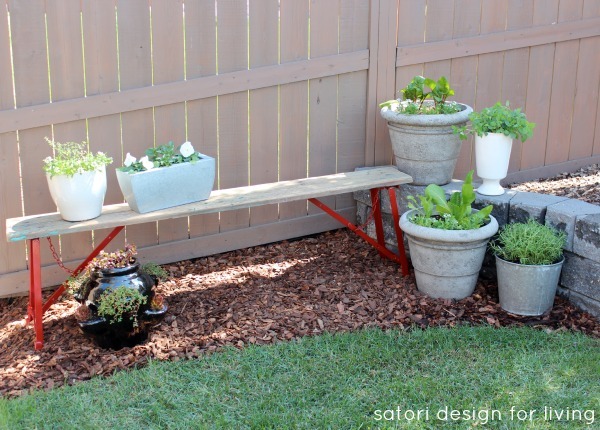 So many great outdoor ideas! Be sure to check out the other hostesses’ beautiful paint projects today! For even more gardening and outdoor inspiration go here. Loving that red against the weathered wood. This looks so great! I might do some potted herbs this year too. Thanks Becki! 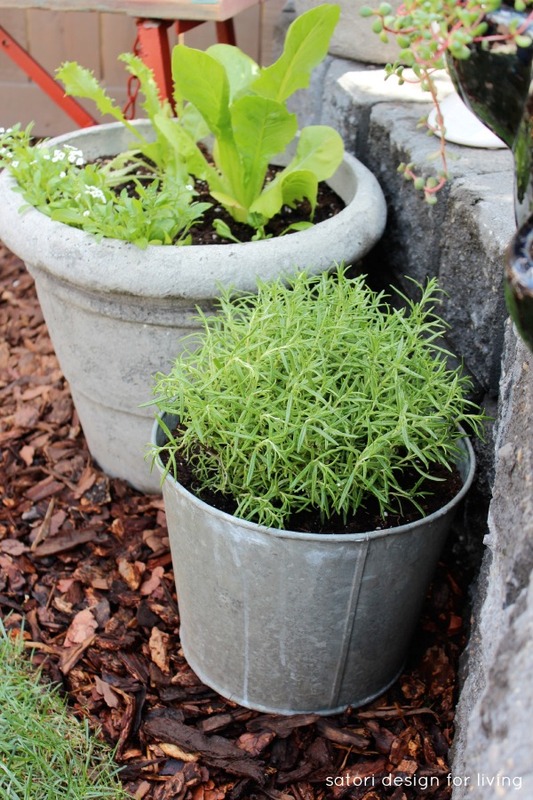 You’ll love having fresh herbs at your disposal all summer long. Best way to add flavour to almost anything! I don’t know how many times I’ve looked over a weathered bench. So cute and useful in a backyard. I would’ve walked past this one for sure. Very rugged, but I thought I had nothing to lose attempting to make it over. So glad I did! 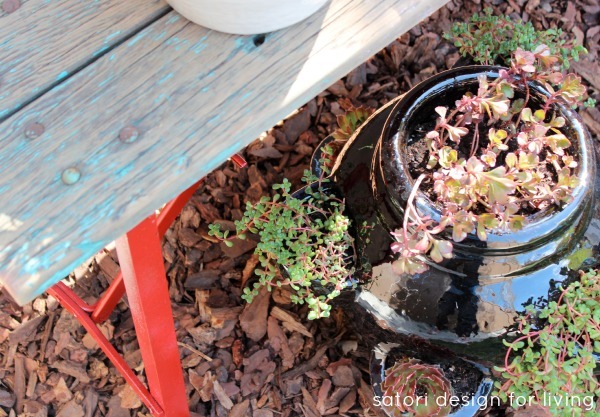 I love how you added bright red to this cute weathered bench. It looks great! I’m a fan of container gardening too. Much less wedding that way! Perhaps a little more watering, but I like that part way more than weeding! I love, love, love this idea!!! The bench adds such character to the space and really seems to give it a purpose!! Thanks Alison! It was pretty easy to put together and I’m really looking forward to having the extra area for growing veggies and herbs. I LOVE your color choice! It gives the bench a bit of zip…….great job! I am really enjoying your blog! Thank you! So glad to discover yours as well! I love it!!! The contrast is my fave and the red is a perfect choice! It’s perfect and really draws the eye into that pretty space! Nicely done! I think it will look better once it weathers a bit more, especially on the areas I had to sand down. Thanks for participating this year. I loved having you! This is so pretty and I love the pop of red under there!!! Thanks Kristin. A departure for me, but I seem to be drawn to the pops of color for outside lately! This looks great! 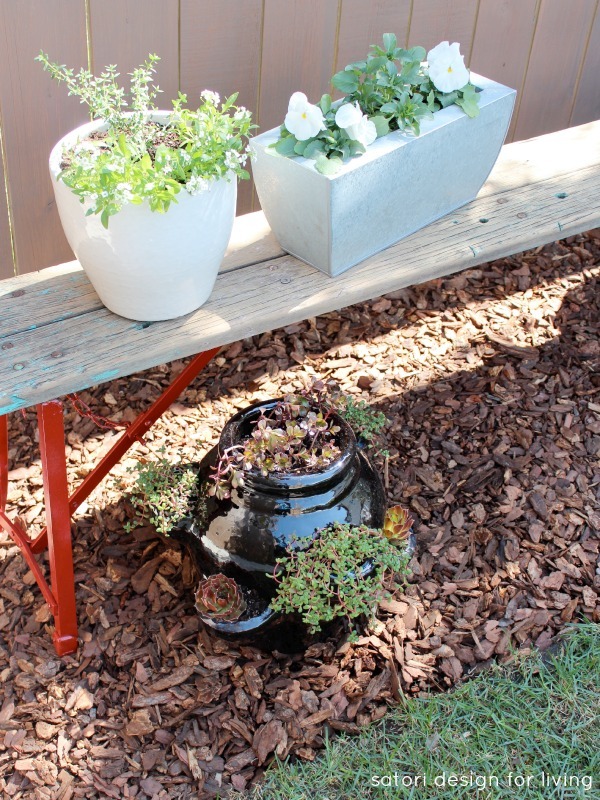 I love the red legs – they add some nice colour to that corner of your yard! Thanks Katie. Did you make any progress outside over the weekend? Thank goodness the weather is a little better now, right? What a great little bench. I love how you gave it a new life. The garden looks great! Thanks Lisa. Yes, a good find. Wasn’t sure it was salvageable, but I’m glad I tried! Benches have got to be one of my favourite things to use for decorating in the garden. I love how you painted the legs red. We have an old bench made from fruit crates found in the basement of our old house. It’s on the deck and dressed with rustic birdhouses and my orchids which I bring outside for the summer. Oh, I bet that looks great. Pictures? It looks so fun… full of whimsy & rustic charm! Perfect addition to your outdoor space! The pop of red is really cute! 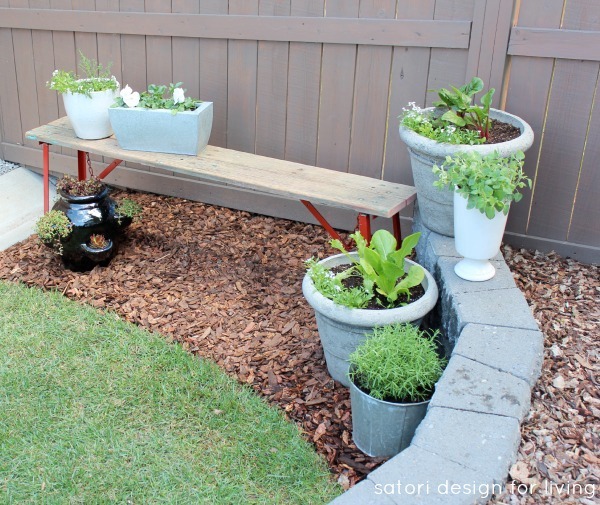 And your container garden is beautiful. Everything looks so beautiful! Love the bench with the bright red legs and natural top. It looks so sweet! 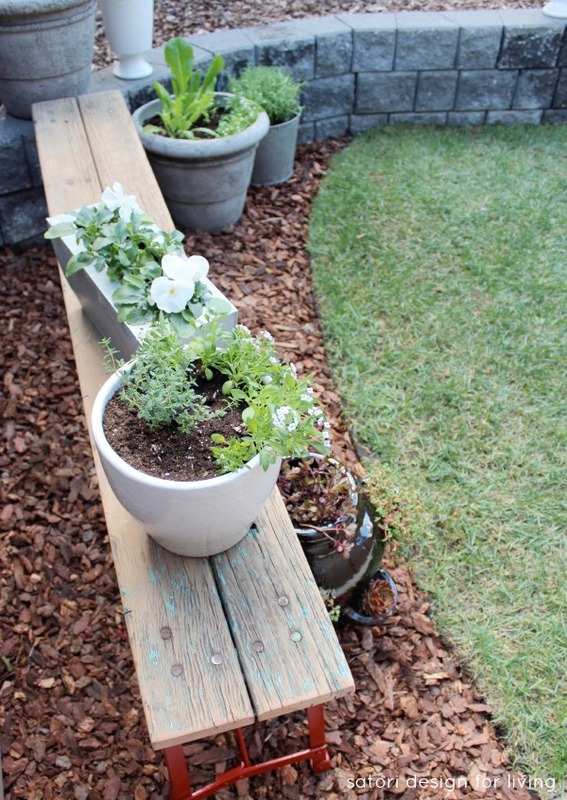 Your bench and potted plants look great Shauna, what a lovely outdoor space!